Your Liebherr WKEes 553 GrandCru integrated wine cabinet guaranteed to be the best price from Cavepromotor in the UK which includes a digital hydrometer. The Liebherr WKEes 553 is a modern, state of the art, luxury integrated wine cabinet in a stainless steel frame, silver painted side walls and an insulated glass door. The Liebherr WKEes 553 has a storage capacity for 18 bottles (Bordeaux size). The Liebherr WKEes 553 has a user friendly control panel to control the temperature zone. Besides the temperature, the Liebherr WKEes 553 GrandCru controls the humidity while the FreshAir activated-charcoal filters ensure optimum air quality. The Liebherr WKEes 553 has a charcoal filter for each wine safe. 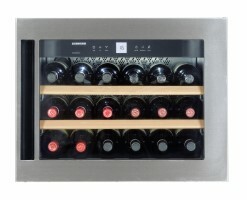 Request a quotation for your Liebherr WKEes 553 GrandCru integrated wine cabinet? To receive the best price for a Liebherr WKEes 553 GrandCru please click on the Request Quotation? or alternativley you can call directly on 020 3318 46 91. Liebherr wine cabinets & fridges are the only manufacturer Cavepromotor sell and because of this we can purchase the Liebherr WKEes 553 Vinidor for the very best price. The Liebherr WKEes 553 door closes on the left side. The door opening side can be swapped, according to your storage configuration. This is something we would be glad to help with, and our representative will provide you with a price quote for the service, should you prefer Cavepromotor to take care of this. The constant innovation at Liebherr reduces the level of energy consumption. The Liebherr WKEes 553 GrandCru is using 130/0,356 kWh. The level of noise is around 38 Db. The Liebherr WKEes 553 has three shelves, including two mounted on a telescopic rails. The digital hygrometer helps you to monitor the humidity level inside your wine cabinet. What would be the ideal level of humidity? Different wine experts share different opinions. To be on the safe side we at Cavepromotor recommend a range between 50% and 75%. Keeping the level too low will affect the cork, too high will result in moulded labels. Every wine cabinet has a climate indication and for the Liebherr WKEes 553 it is: SN-ST. Requesting and receiving a quote for the Liebherr WKEes 553 GrandCru is quite simple. Just click on the button 'Request Quotation' and within 8 working hours one of our wine cabinet specialists will contact you about the Liebherr WKEes 553 GrandCru integrated wine fridge or other wine cabinets we provide and service in the UK.